It is always worth checking whether notices from the Land Registry are well founded, particularly if they are about a potential liability for chancel repair. Ask to see the evidence, do your own research, do not be afraid to challenge the notice if the evidence does not stack up. It may well turn out that the evidence does stack up; at least you will know that (and save the next generation having to return to the question). We have an instructive case study here. 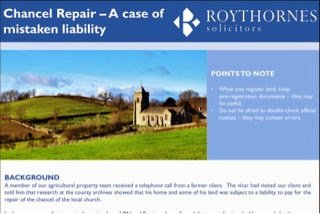 If you have received Land Registry a notice about Chancel Repair Liability and would like to discuss the implications, get in touch with Julie Robinson in the first instance, on 01775 842618 or by email.